Home » Television News » Pratyusha Banerjee death: Was depression to blame? Popular television actress, Pratyusha Banerjee, best known for playing Anandi on the TV show, Balika Vadhu, was found dead in her Mumbai home on 1 April. The cause of her death - a prima facie suicide - has not been ascertained yet. Pratyusha's friends, colleagues as well as other celebrities have expressed their shock at the passing of the 24-year-old actress - who was reportedly found hanging from the ceiling fan in her house. The actress, who hails from Jamshedpur, first ventured into the world of showbiz at the age of 19. She shot to fame overnight when viewers voted for her to play the plum role of Anandi in Colors' Balika Vadhu in 2010. The series helped her become one of the most popular faces of the Hindi TV industry. 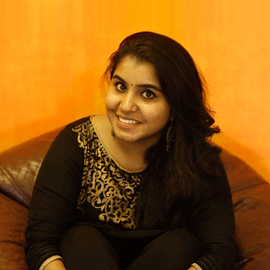 She went on to participate in Bigg Boss season 7 and a number of other serials. She also featured in a few advertisements and walked the ramp. Her success helped her create a massive fan following and helped make her a household name. For her fans, Pratyusha has always been one of the few television stars who seemed to have no qualms about freely interacting with them on social media. The actress was known to keep her social media profiles up-to-date and regularly flooded her Twitter and Instagram timelines with everything ranging from her daily updates, on-the-sets photos, parties, her social events and even some snapshots of her life with her live-in boyfriend Rahul Raj Singh. 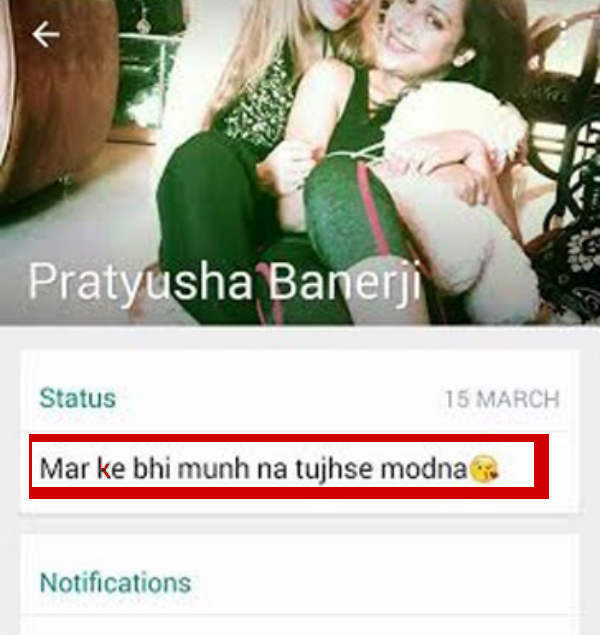 However, one look at Pratyusha's once-populated Instagram account reveals that she last posted a photo 22 weeks ago. Media houses have been circulating her last WhatsApp status, updated on 15 March, which reads: "Marke bhi munh na tujhse modna" (I'll remain loyal to you even after my death). "A person only puts out something as his/her whatsapp status or on a social media platform when he/she relates to it. This also shows that the person wants wants others to know about his/ her status of mind". "It is rare that people don't relate to the things they post on social media. Even if your status update is just lyrics of a song, you'll only post it if you relate to it". "She had disconnected herself from all her friends. She had completely disconnected herself socially. She used to remain upset and most of us know this". This, Dr Mithiya says, could be an indication of depression. He said that a drastic change in the frequency and tone of interaction implied that the person was internally troubled. "If a person has cut down interacting with those people around. He/ she has stopped interacting the way he/ she used to and if there's a drastic downfall in the kind of interaction he/ she used to do earlier, it is a 200 per cent sign of the fact that the person is suffering from depression". "In a celebrity's case, it gets worse because they are always exposed to the paparazzi, they have to look good, they are expected to behave in a certain manner". He also warned that when it comes to celebrities, living away from families in a stressful environment could take a toll on mental health. "There's no space to vent out their thoughts and the problems. Depression is still a stigma. And celebrities are wary about approaching a doctor to discuss their issues. The other reason could be the work stress because they are working 24x7". "In Pratyusha's case, if she has hung herself or if she restricted herself from being a part of the social culture she used to be in, it is a sign that there was something more than the 'normal stress' that bothered her. And for a person who's at this stage of the problem, it is very essential to take help. Because people around that person won't realise that there's something wrong with them. Neither does the person's family realise. It is that undetectable." "This is a wake up calm to families and friends who don't consider depression a medical condition. The death of this young star only reiterates the need to spread awareness about depression."